Leading monsoon expert proves global warming media doomsayers lied to the public on the severity of this year’s floods in Pakistan. Madhav Khandekar was an expert reviewer for the United Nation’s Intergovernmental Panel on Climate Change (IPCC) in their 2007 Report. 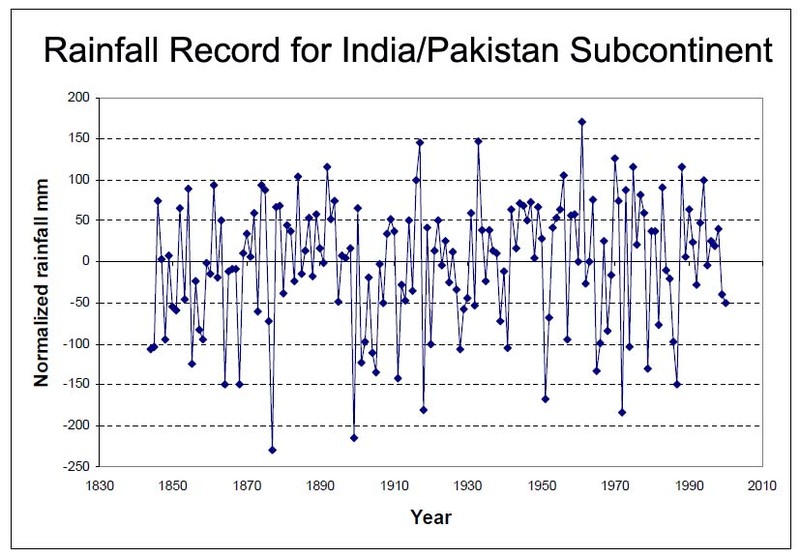 In his latest study he proves Pakistan did not suffer “unprecedented” monsoon floods this year. Rains were only 5% above average. Madhav, who is presently studying monsoon inter-annual variability in the context of global warming and climate change issues, proves conclusively that the India/Pakistan subcontinent has had similar or worse monsoon floods at least SIX TIMES in the last 150 yrs. But even more significant, the records show no human impact whatsoever on the subcontinent’s highly changeable climate. This publication from the Canadian Meteorological and Oceanographic Society Dr. Khandekar conclusively demonstrates how utterly wrong the mainstream media’s reports have been on the monsoon issue. One green media extremist trying to cash in is Peter Sinclair. In his Youtube video trickster Sinclair goes all out to try to smear prominent skeptic, Lord Monckton, but provides viewers with no more than the usual wearisome eco- spin – lots of hot air and short on scientific evidence. That word, “never” has such a profound impact when employed so cynically with a shocking visual backdrop of rotting corpses tossed in muddy raging waters. But “never” cannot possibly be the word to apply to a flood that was only 5% above average. Enough is enough. American voters have delivered a mandate to end this climate fraud. Tired of mainstream media flimflam they came in the tens of millions to the blogosphere where we resolutely name and shame such crooks. Learning the truth, the electorate has signaled a time for change. We must now nail those who have profited financially from this scam, bring civil and/or criminal charges and where possible, put the worst offenders behind bars where they belong. That weasel Sinclair has joined the ‘Al Gore Hall of Shame’ for outright film fakery. If you recall, Gore got a smack on the hand from the judge in the English High Court for his ‘nine lies’ in the shameful mocumentary, ‘An Inconvenient Truth’ yet got to keep his Nobel Prize and never corrected his fake film. That was the wrong message to give to these opportunists. But such eco-fascist lies are lauded by fellow greenshirts. As a token of thanks fanatics dub Sinclair “Good Guy of the Week” on a new dumbed down website. When eco-propagandists profit from the deception it is criminal fraud – make no mistake. It’s all part of a much wider immoral political conspiracy that is prompting ever more honest scientists to speak out. Piers Corbyn, the world’s leading independent long-range weather forecaster bravely denounced the monsoon hype. Corbyn spoke live on Russia Today TV calling the claims a “hoax by gravy-train scientists.” Britain’s finest forecaster joined me in Parliament recently to put our case to politicians who seemed unaware of the true extent of this international fraud. The facts show the 1961 summer monsoon was the rainiest with extensive flooding while the year 1877 witnessed the most severe drought with over 40% deficit in total seasonal rains. Like Khandekar or Corbyn, green extremists and their media puppets pretending to be ‘journalists’ or ‘reporters’ could just as easily have checked the official monsoon records, but they chose not to. Like Gore and Sinclair they tread a dangerous downward path into criminality. The American voters have issued their mandate. Now it is beholden on those Republicans recently installed in the House and about to take seats on climate-focused committees, to serve justice and bring the crooks to account. Khandekar M. K., ‘2010 Pakistan Floods: Climate Change or Natural Variability?’ (October 2010), Canadian Meteorological and Oceanographic Society (Vol.38, No.5).